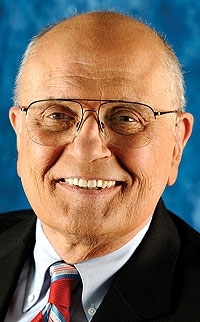 John Dingell: Has concerns about the bill. WASHINGTON -- New auto safety legislation proposed in the wake of Toyota's recall problems is drawing criticism from House Republicans and Michigan Democrat John Dingell, suggesting that changes are in store for the Democratic leaders' bill. Republicans on the House Energy and Commerce Committee said almost unanimously today that the draft bill would unduly expand government authority and undercut automakers while they are rebounding from a severe slump. “I'm not sure it's time to pile on the auto industry,” Rep. Joe Barton of Texas, the top Republican on the committee, said at the hearing of the subcommittee on commerce. Dingell, in a statement, said: “As with most first drafts of legislation, the Waxman-Rush bill has provisions that, in my view, require improvement, especially as they relate to the bill’s practicability, both for federal regulators and those subject to federal regulation," Dingell said in a statement. Chairman Henry Waxman, the bill's chief sponsor, said his goal was to have the committee pass a bill that both Dingell and he could support. The measure seeks to improve vehicle safety technology by establishing performance standards for brake override systems, black-box crash data recorders, pedal placement and electronic systems. It also would toughen federal oversight by removing the $16.4 million cap on fines, giving the National Highway Traffic Safety Administration the authority to order a recall if it identifies an imminent hazard, doubling federal funding for NHTSA and imposing fees on automakers to fund increased resources for the agency. A couple of bill provisions drew bipartisan support, most notably the requirement for brake override systems. A new override standard “is something we certainly support,” Barton said. He and Rep. Ed Whitfield, R-Ky., also endorsed a proposal for a more consumer-friendly NHTSA complaint database. The Senate Commerce Committee is to hold hearings on a similar bill introduced this week. The Obama administration has not yet taken a position on the bill, NHTSA Administrator David Strickland said in an interview before the House hearing. In prepared testimony, though, he expressed support for a couple of provisions, including giving NHTSA the authority to order recalls if it thinks a hazard is imminent. “This provision gives NHTSA an important avenue through which to deliver on its consumer protection mission -- a mission I strongly believe in,” Strickland's written testimony says. Rep. Bobby Rush, the subcommittee chairman, criticized Strickland's testimony. “There's a lack of detail that leaves us wanting,” said Rush, D-Ill.
Strickland said the Transportation Department and the White House were still reviewing the legislation. The bill “does give a fantastic foundation in helping us be a stronger and more transparent agency,” he said. Dingell asked Strickland whether the proposed $3-per-vehicle fee for automakers was arbitrary and whether it matched the agency's needs. The lawmaker also asked whether fines on automakers should be subject to judicial review, and whether NHTSA had a definition for the kind of “imminent hazards” that could trigger immediate vehicle recalls. Finally, Dingell asked if there was some guarantee that the new safety technology requirements would be limited to new cars. Strickland promised to get responses for Dingell.